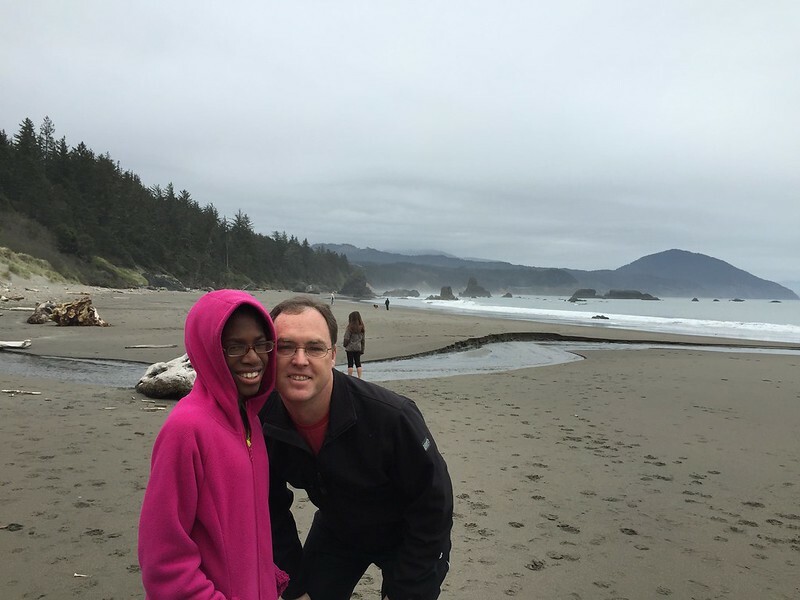 We made two stops along the gorgeous Oregon coast, one in [Port Orford](That evening we celebrated ) and the other in Lincoln City. Most of the coast is pretty isolated and according to my friend in Portland, it's the "place to go if you want to escape the law and live off the grid". The coast is dotted with beaches, little villages and that's about it. There's not a lot to do during the off season, however we did have a good time in retrospect even though the weather was a little cold, windy and sometimes rainy. Port Orford was a 4 hour drive from Myers Flat, CA and one of the first cities you come to as you cross the state line. 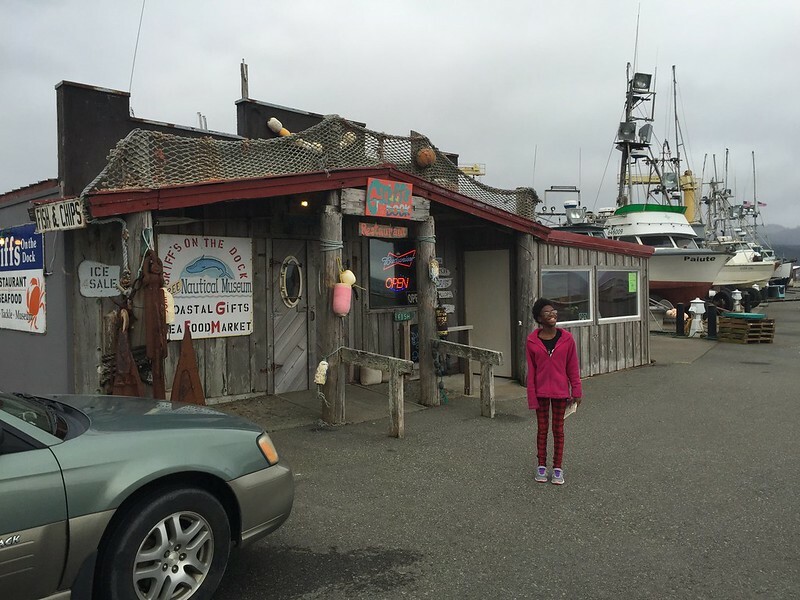 There wasn't much in Port Orford... maybe 5 restaurants, a grocery store and a hardware store. It wasn't season yet and most of the shops were still closed. The best part of Port Orford is that they have an extremely loud tsunami siren that goes off each day at noon. Apparently people in Oregon are paranoid about natural disasters. The RV park was really nice and the owner walked us out to our super easy to get into pull through. For dinner he recommended Griff's on the Dock so we headed there after getting setup for a late dinner. We had a hard time finding the tiny shack as it was literally out on the dock next to the boats. 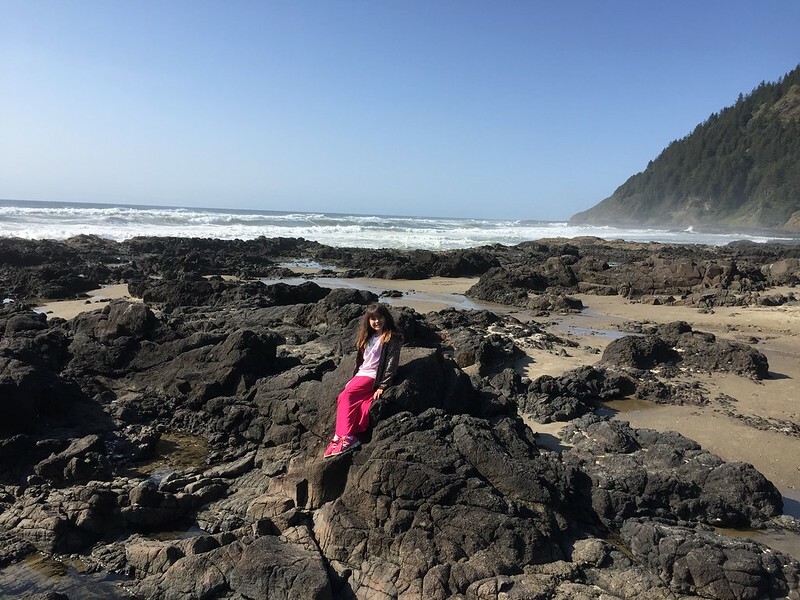 Most of our time in Port Orford was spent with school, work and watching "Schoolhouse Rock" videos but occasionally we'd ventured out for some fun stuff and food. We'd walk the block or two into "town" to pick up dinner or down by the beach see the rocks and waves. Not an exciting time in Port Orford but we needed the downtime. 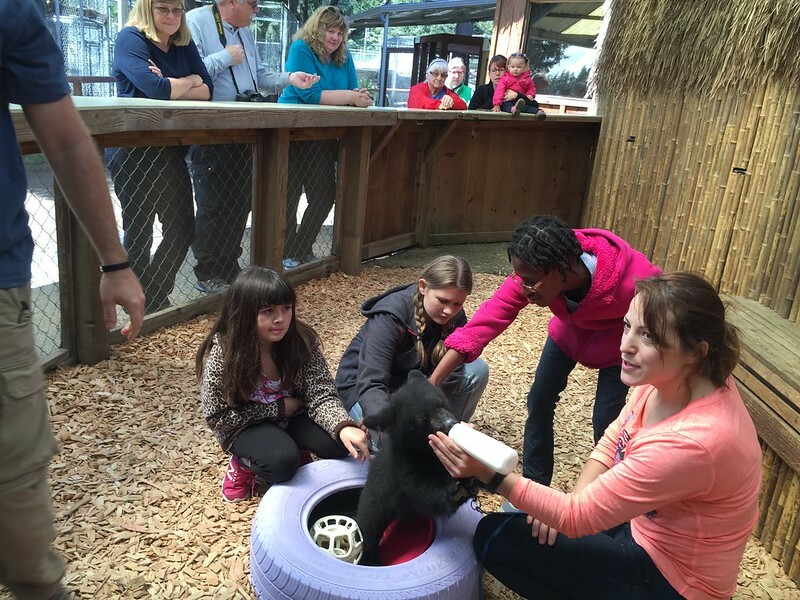 Cathy always tries to keep us busy with fun, educational activities, (she's awesome!) 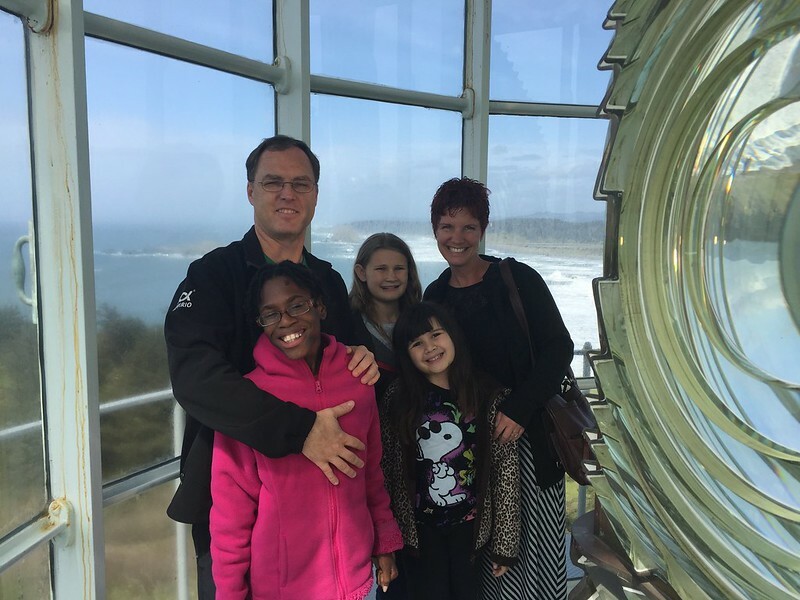 so after work on Friday we drove 5 miles or so down the road to visit the Cape Blanco Lighthouse. It was only 63 steps but still pretty impressive from the top. We got a private tour (we were the only one there!) from a couple of volunteers but, unfortunately, Cathy and I found it more interesting than the girls did. It was a impressive view and we tried to get the girls a job washing windows but no takers. Saturday was a full day of activities! Cathy wanted to head an hour or so north to Coos Bay as there was a mall there and she wanted to take Hali clothes shopping for her birthday. On the way north we stopped at the West Coast Game Park Safari and had an absolute blast! Check out the pictures below but the girls had an oppotunity to see a tiger up close; pet baby bears, a lynx, a possum, ferrets, baby foxes, a baby sheep; and feed the goats and peacocks. The girls absolutely loved it!! 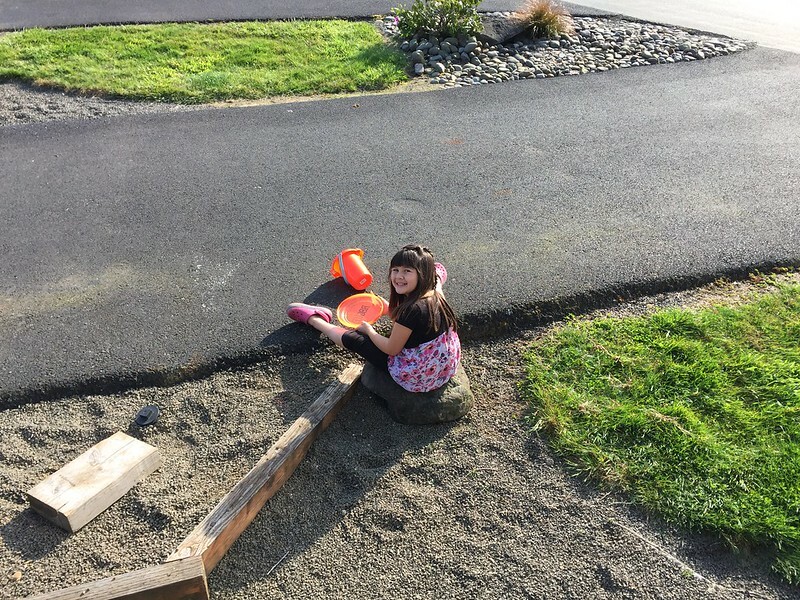 Afterwards we headed further north to Coos Bay and I entertained the two little girls while mommy spent some quality time shopping with Hali. After that we hit a little hole-in-the-wall pizza joint, killing time before the movie "Home" started. It was a long drive back home but everyone was still excited from the day. After school on Monday we went a local faux Prehistoric Gardens. 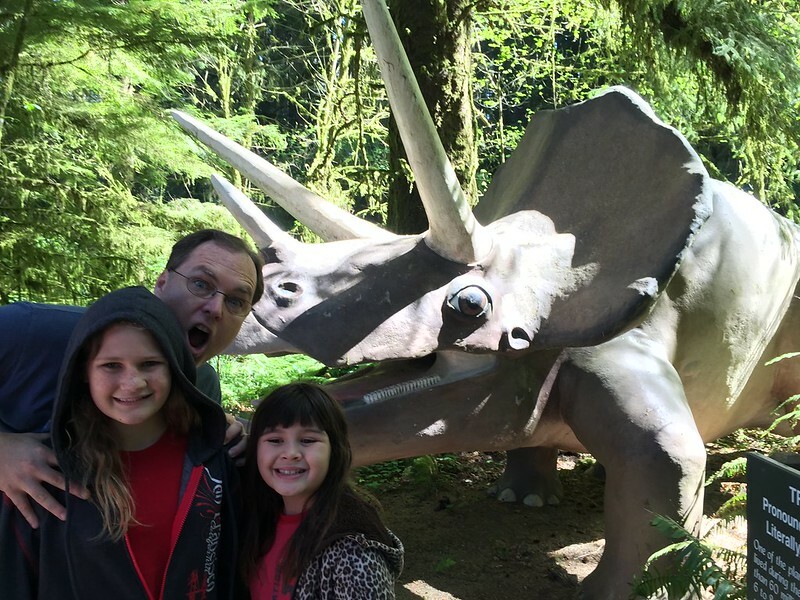 It was roughly a 30 minute walk through the beautiful forest and the girls had fun looking at all of the dinosaur "exhibits" and talking about Bigfoot. Everyone participated in the argument whether or not Bigfoot is real (he is!!) and it became very heated. Afterwards we killed some time on the near Kissing Rock. Cathy and I took a walk along the beach while the girls stayed in the truck on their computers. I made rock angels and we took some selfies while walking up and down the beach. The girls had been asking for a pet for a number of weeks so Cathy and I decided to find some "pet rocks" for them. Hali and Lexi really loved theirs (Hali carries hers all the time) but Kira wasn't impessed whatsoever. When I asked her what she named her rock she said, "I named it Richard cause I don't like him. I don't want a rock. I want a dog". It was finally dinner time and we found the brewery we were looking for which turned out to not have a restaurant or be open. So we punted and headed back to Port Orford for probably the worst meal we'd had in a long time. Still a good evening. Late Tuesday afternoon we packed up in the slight rain and headed four hours north to Lincoln City, the vacation destination for Portlandiers. The RV park was nice but we had a few issues with it. We had to pull a little wide to get our long RV around the corner of our spot and almost got stuck in the grass. In retrospect I wish we'd have purchased a 4x4 for these types of situations. Also, the RV park was on the side of a hill and we did an extremely bad job of leveling King Kong. I had to get inside and help push one of the slide-outs out as the motor couldn't handle the angle. Plus, food and beverages (mostly root beer and olives) fell out of the refrigerator and onto the floor shattering glass all over the place. Cathy was hot!!! So after getting everything cleaned up and put into place, we drove 30 minutes north to Pelican Brewery in Pacific City for dinner. Going to a brewery for dinner always makes Cathy feel better. The brewery was the city and it was located right on the beach. The food and beer was great and the view was spectacular! Wednesday after school and work we decided to drive back south to the famous Sea Lion Caves! For some reason, Cathy really wanted to see those damned sea lions. She called ahead to make sure there were sea lions lounging about and was assured that there were plenty to see. So we hopped in the truck and took the two hour scenic route down the coast (everything is a scenic route in Oregon!) only to find that the "attraction" was closed. Apparently the elevator had just broken and no one was able to see the sea lions! Oh well.. they did give us a free cup of coffee for our troubles. So we hopped back in the truck stopped at Cape Perpetua on the way home for a few minutes. We took a ton of great pictures! To break up the long drive we stopped in Newport at the Rogue Brewery for dinner. 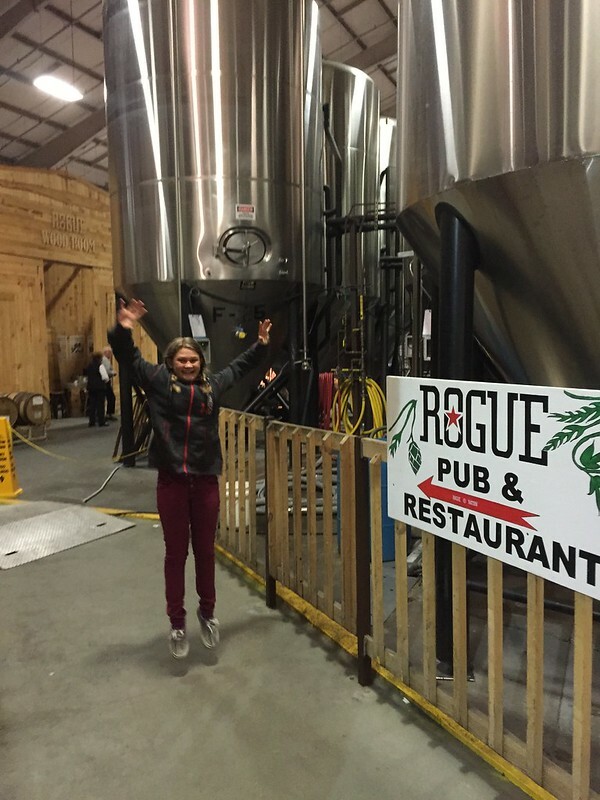 You can get Rogue beer nationally so I've always been a fan and I was super excited to stop. It was really cool to walk through the actual brewery on the way to the restaurant, and as experienced brewers, Hali and I were impressed!! The beer was great and so was the food. They have the best chowder and when I commented on it to the waitress she gave me a free cup to take home! I love breweries! Since I'd partaken too much of the local fare, I let Cathy drive home. She's very competitive and since I'd dropped the house on the truck in Anaheim, she had to one-up me. So for some reason when we got home she felt the need to back the truck into our spot instead of pulling in as usual. Well, she relied too much on the backup camera and beepers and gently "tapped" the tailgate on the RV. Apparently the RV was higher than the sensors and it didn't pick it up as a obstacle. 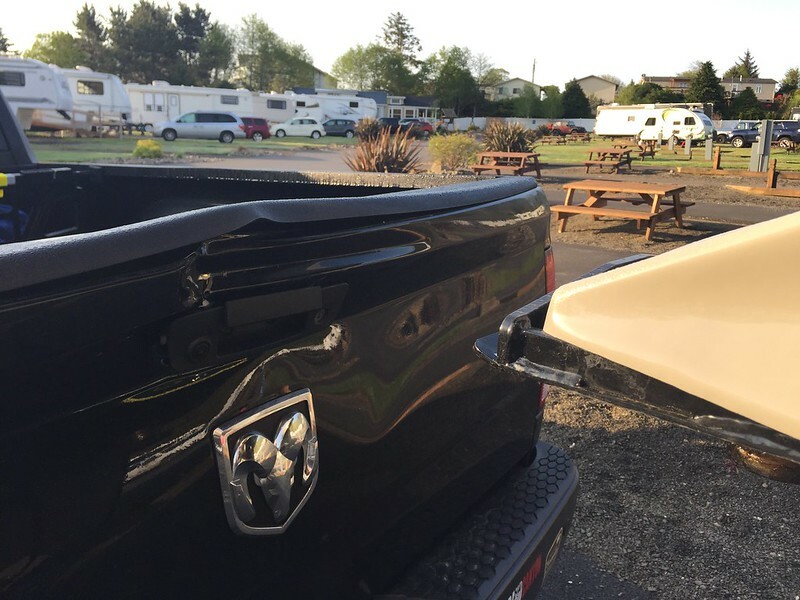 It wasn't that bad of a dent but the big problem was that we were leaving in two days and we couldn't get the tailgate down to hook up the RV! Yikes! The next day I had a lunchtime appointment with a podiatrist to have my feet look at as I was still suffering from plantar fasciitis. After he hooked me up with insoles and instructions, I found a local garage and they were able to beat the crap out of the tailgate until they got it opened. Crisis averted! I called around to see how and where we could get a new tailgate but we decided to wait until we are back in Sarasota to get it fixed. At least we could leave for Portland the next day! That evening we celebrated Hali's 13th birthday. She had been counting down the days for almost a month now and it was driving me crazy! She was finally a teenager and now we could officially begin to loathe her. 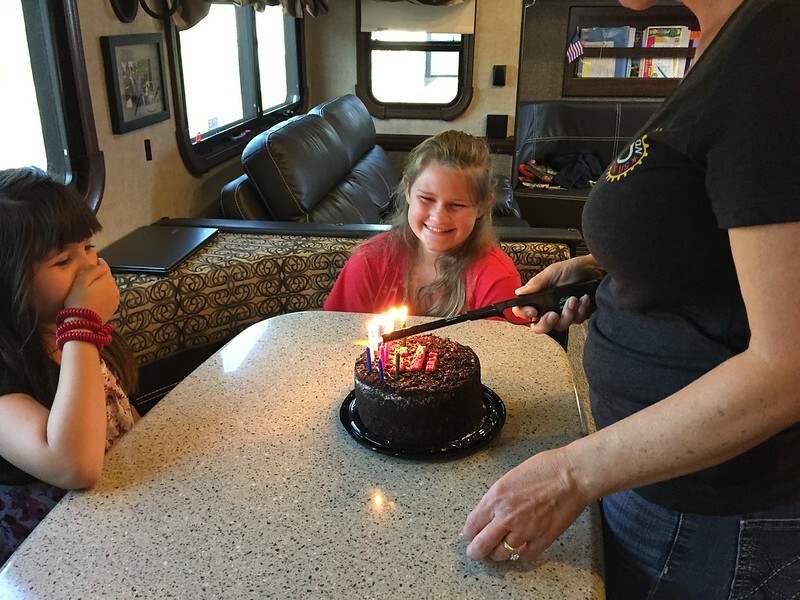 She opted for pizza in the RV instead of going out and everyone had fun singing and blowing out candles. She got a bunch of clothes and gift cards and was very happy to finally be a teenager. 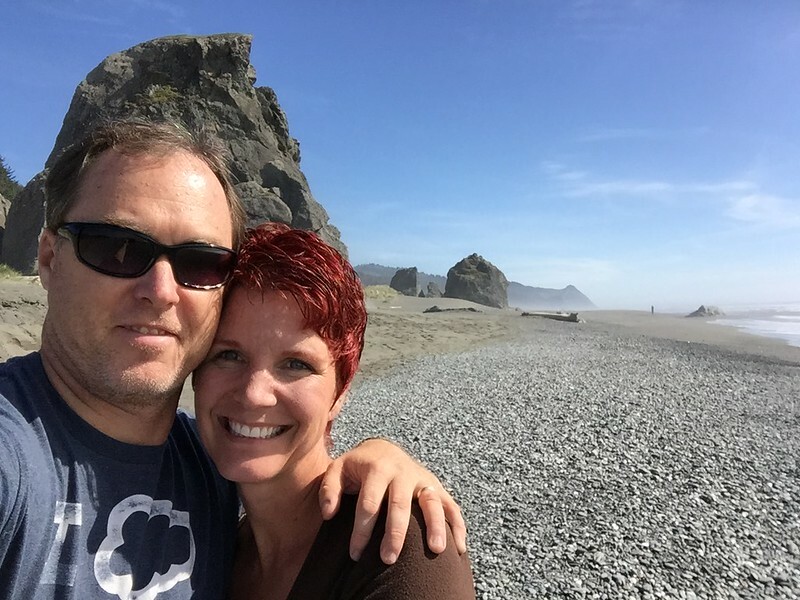 On Friday afternoon we hooked up, pulled out with no issues and made our way to Portland.